Oasis Ukulele Strings - 8100 - WARM High G set - Double Length, Cut into 2 sets! Flourocarbon gives the ukulele a crisp sound with clear projection. 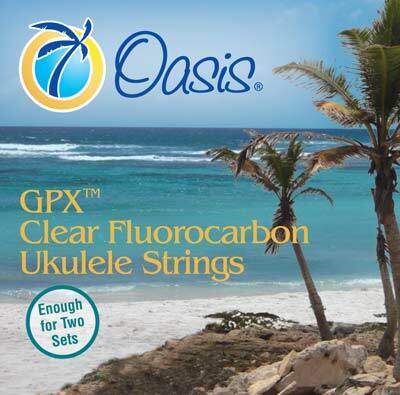 This is the reason why Oasis uses carbon as their choice of string offered for your ukulele. Another feature that Oasis offers is the longer length of string in each pack - 63" - there is enough length for two sets! This set is designed for High G tuning where the 4th string G is carbon (non wound) and Soprano, Concert or Tenor size ukuleles. Members of a leading ukulele forum designed the strings and labeled them Warm and Bright. 4th High G Carbon .025"
Great service and quick shipment from Strings by Mail!!! Great selection and great support if needed. I can’t say enough good about Strings by Mail. These strings sound and play how I expected (which is good), but I've had two issues so far. First not all of the strings were long enough for a double set (the 2nd string in my case wasn't even close). Considering they say to cut them in half before installing (good thing I didn't) this is a problem. Now if I wanted to use this set again I'd have to either buy a new set to get another E-string or use one from another set. Second the 1st string has a problem where it starts coming apart after a few days. It started with a little hair sticking up off the string in one place and quickly turned into multiple hairs of increasing thickness. I replaced the string with the other half (luckily the 1st string was long enough for two uses) and unsurprisingly it is now showing the same issue (not surprising since it is basically the same string). I installed these on a brand new Pono solid wood soprano. This was my first experience with Oasis strings. I would classify these as medium gauge, which makes them easy to play and comfortable. The sustain seems very good. A bonus that you get essentially two sets of strings for a competitive reasonable price. THE BEST SOUNDING STRINGS I'VE EVER HAD. Love my Oasis high G warm strings. They sound so sweet that I want to play my ukulele all the time.